When a story is ‘done’ and ‘on the bus’, it’s expected to stay that way until go live. When working in a large team that share a code base, it’s common to break each others stuff. Automated regression testing has long existed in most applications but for many web sites because it’s impossible to write tests to verify if a website was being displayed correctly. Today opensource tools like Wraith, Huxley, PhantomCSS, PhotoBox etc solve this issue using screencapture comparison techneques. What will this post help me do? Automate website regression testing for agile teams that use JIRA. This will prevent you from committing code that can undo previously completed stories. JIRA stories are used to add test URLs. Every team member can view them which help increase test coverage. 1. Early discovery of regression issues leads to immediate fixes, saving time and effort otherwise wasted on raising bug report, context switching etc. 2. This will lead to a happier team. 3. No Less nasty surprises/bugs the week before going live. PhantomCSS – For screen capture bases visual regression. Git Hooks – Used to force running of tests before commiting. 1 Create a custom field named “Test URL” in JIRA. 3. Get test URLs of stories in the ‘Done’ column from the JIRA REST API. 4. 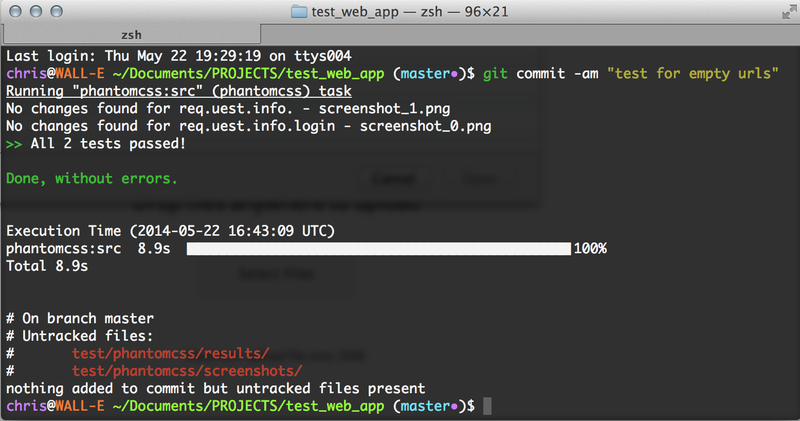 Use git pre-commit hook to run PhanthomCSS test suites on the URLs before each commit. Now all the tests will have to pass before being allowed to commit. Next time you start a project, follow these 4 steps. 2. Add the following to your grunt file. 3. Create a test suite file with your JIRA project information. Finally, sharing and maintaining git hooks with the team can get messy because git hooks are not a part of source control, so we use grunt git hooks module to manage it. 5. Add the following to your grunt file. 6. Use grunt githooks to add git hooks into your local git. Now every time you commit, the tests will be run from JIRA story URLs and the commit will be rejected if tests fail.